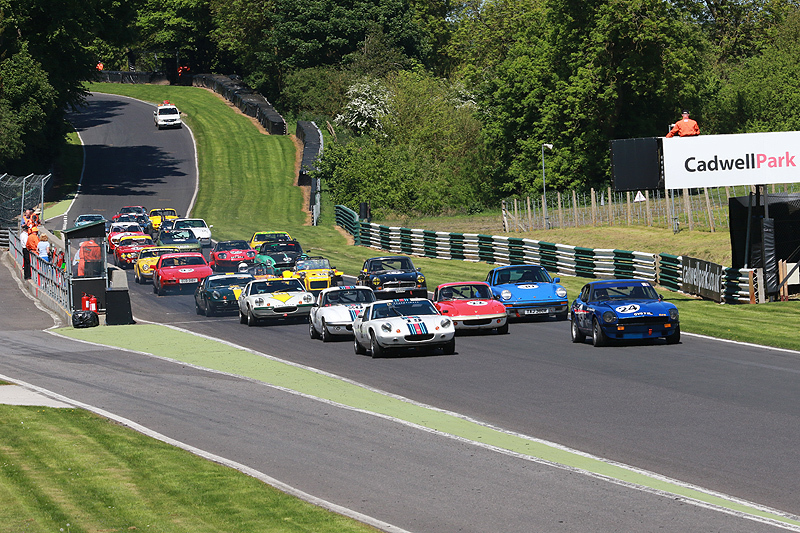 Some superb racing played out in glorious sunshine made the HSCC’s annual visit to Cadwell Park for the Wolds Trophy (May 19/20) a soaring success. First out in front of a good-sized crowd on Saturday were the Historic Touring Cars, with an added group of invitation class cars from the over-flowing 70s Road Sports field. The evergreen Jonathan Lewis loves Cadwell Park and showed it to good advantage by taking his Mini Cooper S to a clear win in the first race, despite the best efforts of early leader Richard Belcher in his Lotus Cortina. “I enjoyed that,” said Lewis. “I was trying to do it quickly to get back to watch the Royal Wedding,” he added. Behind Belcher, an excellent battle raged for third although Rob Wainwright retired his flying Austin A40 at mid-race after getting some damage at the front of the car. Instead, Mark Watts (Ford Mustang) just held off Roger Stanford (Lotus Cortina) and Bob Bullen after a great battle. Race two on Sunday was also a cracker as Stanford wrestled his Cortina to the front to beat Bullen by a third of a second with Lewis close behind in third. 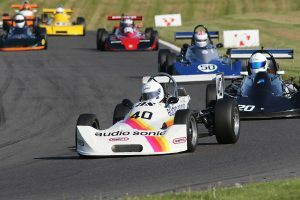 With poleman Jonathan Hughes (Lola Mk2) posting an early retirement, the front-engined Formula Junior race became a repeat of the Donington battle between Ray Mallock (U2 Mk2) and Chris Drake (Terrier). Drake led early on but Mallock then edged ahead to add another victory to his impressive Diamond Jubilee World Tour tally. “Ray’s an exceptional driver,” said Drake who was still contending with the misfire that struck at Donington. By the end of the race, Drake had been caught by Stuart Roach. After a tardy start and his third place finish on Saturday, Roach was right in the groove on Sunday in his Condor S2 and tigered ahead of both Mallock and Drake to win at one of his favourite tracks. Not for the first time this season, Charles Barter was slow away into the 70s Road Sports race as a new clutch in his Datsun 240Z gave him some concern. However, once into his stride, Barter worked through to second, hunted down early leader Jeremy Clark (Lotus Elan) and then edged ahead mid-race. Double Snetterton winner Clark did not give up, however, and gave spirited chase until a moment at the Mountain was followed by a spin at Hall Bends. While Clark got push-started back into the race Will Leverett (Lotus Europa) and John Williams (Porsche 911) were able to nip ahead and complete the podium. “It was good off the start, but I couldn’t stay with them,” said Williams. With Barter senior absent on watercress duty on Sunday, his son Julian took over the 240Z but it was Will Leverett on top to take the win from Clark and Will’s father Mark Leverett (Elan) who finished with Barter on his tail. Local ace Cameron Jackson set a blistering pace to take a consummate double in the rear-engined Formula Junior races in his Brabham BT2. “That was great: the car is flying and it’s a joy to drive,” said Jackson. His stunning speed, notably through the Mountain, sent Jackson clear of his rivals, who were headed by category newcomer Michael O’Brien in the ex-Alastair Pike Lotus 20 from the Silverstone-based Speedsport team. “The car is still a work in progress,” said O’Brien, who claimed two second places to his friend and former team mate. Peter de la Roche (Lola Mk3) and Jonathan Fyda (U2 Mk3) led the chase of the two rapid leaders. 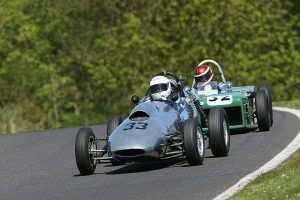 The Historic Formula Ford pack again delivered some incredible racing, although Sunday’s race was halted when a sizeable accident befell Nelson Rowe. Thankfully, though his Crossle was significantly damaged, Nelson was unharmed. Sadly, his weekend went wrong on Sunday with a big accident that prompted a red flag. Jackson pulled clear of Grant in the re-start to score his third win of the weekend. Meanwhile, the qualification races provided wins for Brian Morris and Ed Thurston, who was recovering strongly from a non-finish in Saturday’s championship race. Thurston won the qualifier from 12th on the grid and then raced from 15th to third in the second championship race. Hoping to make up for his early retirement in the front-engined Formula Juniors, Jonathan Hughes (Merlyn Mk14) set off in a superb early battle with Jon Milicevic (Brabham BT21B) in the opening Historic Formula 3 race. Sadly, this spirited contest was not destined to last as Hughes coasted into the pits with apparent gearbox dramas. That left Milicevic clear, but he was disappointed to lose his rival. “I was so pleased at the prospect of a humdinger for 20 minutes,” said Milicevic. Instead, Paul Waine moved into second to give his De Sanctis its best ever result in a fine second and quite possibly the marque’s best UK race result while Christoph Widmer was an excellent third in his Brabham despite a strong challenge from Jon Waggitt (Chevron B15) and Michael Scott (Brabham BT28). “I’ve never driven as fast before at Cadwell Park,” said Widmer. “It is one of my favourite tracks,” added the Swiss commuter. Milicevic added a second win on Sunday as Widmer again took second, but only narrowly over the chasing Scott. 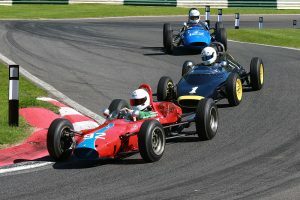 Benn Simms was the class of a capacity Historic Formula Ford 2000 pack to win twice and make up for a torrid time at Donington five weeks earlier. Simms flew over the Mountain to take a resounding double as Ian Pearson (Royale RP30) twice finished second on his seasonal debut, despite a slow start in the opening race. Jason Redding was impressive as he took the final step of the podium in both races. John Davison romped away to win Saturday’s Historic Road Sports counter in his Lotus Elan but was denied a weekend double by a late retirement on Sunday. Kevin Kivlochan led the early laps in the opener but knew that he would not keep the Elan at bay and then retired when the glove box fell off and disconnected the fuel pump. From 18th on the grid for the second race, Kivlochan battled up to second place, but Richard Plant’s similar Morgan Plus 8 was secure in the lead. Mark Charteris was a spectacular double winner in Classic Clubmans after his main rival John Harrison was a casualty of qualifying. In the first race, Charteris went well clear of the battling Adrian Holey and David Wale, while Wale turned the tables later on Sunday to finish second behind Charteris. Finally, two races for the Lackford Engineering Sprite and Midget Challenge ended in wins for Steve Collier.